The White Dog Blog: A very sad day, indeed. Bob Bush (a/k/a Bobbie or Bob Barker), of Dallas, Texas, died Thursday, July 26, 2012 at Highland Park Animal Clinic. Born in Houston, Texas on November 12, 1997, Bob was the runt of the litter, who grew up to be the sweetest, most handsome West Highland Terrier in the State of Texas. Independent and feisty, Bob never met a stranger and loved to wander into a neighbor's home for a visit. He enjoyed long walks to the park, chasing squirrels (often resembling a hovercraft), attacking the sprinkler heads, hanging in the kitchen for a tasty scrap, and sitting in the easy chair for a good back scratch. He had no fear of any dog - of any size. Bob survived two near death experiences early in life when he consumed a jumbo container of chocolate M&Ms and when he got rolled by a Jeep Cherokee while playing chase with his friends around the neighborhood. His favorite foods were boiled chicken, Snausages, and bacon. Bob was a certified pedigree member of the American Kennel Club and born from the Champion Wiskybae line. He frequently vacationed at the family lease in Hico, Texas, at JD Kennels Camp David for Dogs in Royse City, Texas, and at Landmark Retrievers in Ennis, Texas where he loved playing with and barking at all the other dogs. Bob was well known at JD Kennels for his numerous girlfriends and for hanging with his best male friend, a snorting bulldog who followed him everywhere. Bob is survived by his loving family, parents Nancy and Bud Bush, brothers Will and Sam Bush, nephews Jessie and Gauge Bush, niece Margaret Ann Bittles Bush, and many other friends and family members including Bailey Jones, Theo Bush, Darby O'Toole, Duke and Charlie McManus, Lila and Otis Goff, and Lester Culpepper. In lieu of flowers, please make a toast and say a little prayer for Bob. Thanks. 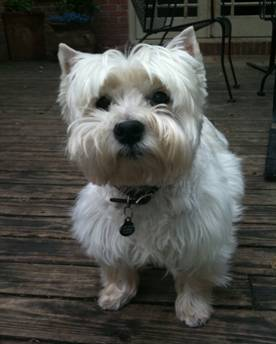 We are so sorry to hear of the loss of this wonderful Westie. Please pass on our sympathy to his family and friends. We are sorry to hear about Bob. OUr thoughts and prayers go out to his family. He is running free now but his family will miss him. So sorry about Bob, he sounds like he was a great dog! Oh we are so sorry, we hate to hear about the loss of any dog, but especially a Westie. Oh, that is indeed sad news. I'm so very sorry. Just remember he is running free, and enjoying all Snausages he can eat. Hugs to his peeps. So sorry to hear about the loss of this doggy, thoughts are with his family. oh no! Bob is gone to the biggest dog camp in the sky. He will be missed. Nice tribute! Oh Bob!!! You are an angel dog now!!! What a sweetie!